China's sports administration is set to implement a plan to revive the fortunes of Chinese soccer. It's no wonder Chinese soccer is in the doldrums. Stories of violence, corruption and age cheating are common within the domestic game. However, hope is finally at hand after China's sports administration unveiled a series of key steps designed to save Chinese soccer and pave the way to a brighter future. Last week, a group of high-ranking Chinese sports officials returned from a fact-finding trip to Japan. During the trip, the officials learned how soccer had been successfully developed by the Japanese. The group returned to Beijing yesterday and within the next few days will instigate a comprehensive plan to revive Chinese soccer. The group will be spearheaded by Cai Zhenhua, China's deputy sports chief. The plan includes a number of concrete measures, and has three key steps. A leading group will be formed to provide policy support for the development of soccer in China. Officials from the Development and Reform Commission, Ministry of Finance, People's Bank of China and Chinese Football Association (CFA) are expected to make up the group. State-owned China Central Television (CCTV) ceased its coverage of the Chinese Super League (CSL) in 2010 because of corruption scandals and the generally poor image of soccer in China. "We will have a series of live broadcasts next year, including the domestic league and national team games. We are working on the details of the broadcasting plan,"the official said. A soccer university will be built in the coastal city of Qingdao, Shandong Province. The construction of youth soccer training camps has already begun in other cities in Shandong. China's soccer slump has long been attributed to a lack of top quality young players. 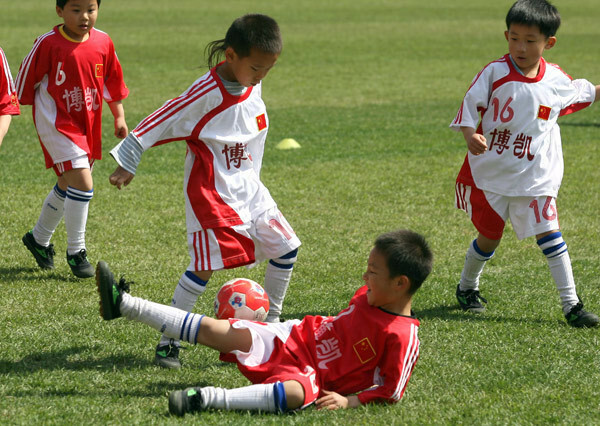 At the end of 2010, China only had around 7,000 players under the age of 18 registered with the football association. By comparison, Japan had 500,000 under-18s registered. Subsequently, the development of youth soccer in China has been made the top priority. Since last year, the CFA has carried out a concerted campaign to boost the sport in China in terms of fighting corruption, improving youth development, training referees and inviting world-class foreign coaches to help the men's and women's national teams. However, it is still unclear whether these efforts have halted the downward trajectory of soccer in China. Many hope that the new revival plan will be just the tonic for the ailing domestic game.